The sun is 4.5 billion years old and is the main source of ultraviolet radiation in our environment. The sun emits two different types of ultraviolet rays UVA & UVB that are harmful and damaging to the skin. It also emits UVC but this doesn’t penetrate the atmosphere therefore doesn’t pose a risk to the skin. Exposure to ultraviolet radiation is a major risk factor for most skin cancers and is the primary cause of skin ageing. UVA rays can penetrate through clouds, windows and glass. These rays penetrate into the skin’s dermis (the deeper layer) and harm the skin by causing ageing and photodamage. Most sun beds have large amounts of UVA which is why sunbed users suffer accelerated ageing. UVB rays are more potent than UVA rays as they can directly damage the skin’s DNA. These rays are the main rays that cause sunburn. UVB rays are thought to cause most skin cancers. Most modern day sunscreens are broad spectrum which means that they protect from both UVA and UVB rays. Current advice is that broad spectrum sun protection should be worn throughout the year for anti-ageing and for protection against skin cancer. Physical sunscreens work by sitting on top of the skin and deflecting or scattering UV rays away from the skin. They contain ingredients like zinc oxide or titanium oxide or a combination of both. These are good (esp. zinc oxide) for anyone with acne- prone or sensitive skin e.g. eczema or rosacea and are recommended for use in children. Modern physical sunscreens no longer feel heavy, thick and white on the skin. 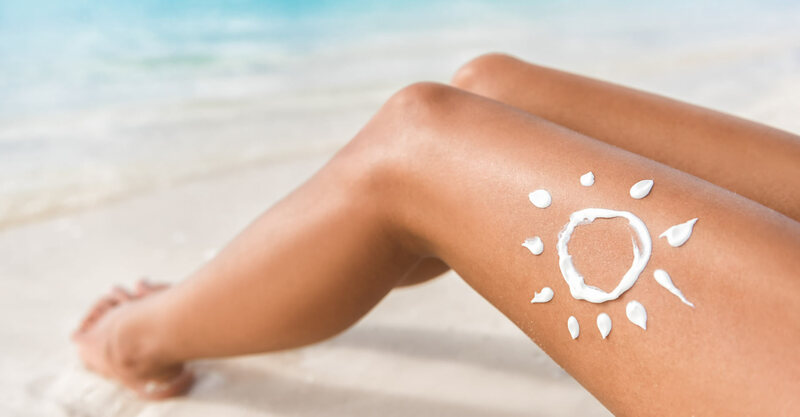 Chemical sunscreens contain organic compounds like oxybenzone, avobenzone and octinoxate that create a chemical reaction that changes the UV rays into heat which then gets released by the skin. Chemical sunscreens often feel nicer on the skin and often have the added benefit of peptides, antioxidants and hydrators in their formulation so they are often more sophisticated for daily use. Occasionally chemical sunscreens can sting the eyes and are more likely to cause allergic reactions in those with sensitivities. will allow you to be in the sun 15 times longer than if you were without protection. SPF15 protects against 93% of UVB rays, whilst an SPF 30 will protect against 97% of UVB rays and an SPF 50 protects against 98%. How much sunscreen should I wear? Most of us don’t wear enough sun protection to get the full benefit of the product. The standard rule is that you need to use an ounce (or a shot glass full) of sunscreen if you want all-over body coverage. For the face and neck you need a 10 pence coin size of product, spread evenly. You should not rely on make-up powders or foundation with SPF as your sun protection as most people don’t apply enough to make them protective. For example, studies have shown that you would have to apply 7 times the normal amount of foundation to get the SPF benefit claimed or 14 times the amount of powder. Clearly this isn’t ideal. Sun protection should always be the last thing you apply to the skin. Any moisturiser or lotion applied to the skin after sunscreen will dilute its protection. You can of course layer your sunscreen and use a pressed make-up powder SPF afterwards to add extra protection. No sunscreen can be entirely waterproof so for best protection reapply your sunscreen after water exposure, heavy sweating or after 2 hours. Is a moisturiser that has SPF in it as effective as a sunscreen? A moisturising SPF is a fantastic investment as it gives sun protection as well as providing hydration for the skin. Find yourself a moisturising SPF that applies nicely on to the skin and it will be your best anti-ageing investment ever. Remember that humans need sunshine to make Vitamin D. We strongly recommend that you supplement your Vitamin D levels if you wear SPF to ensure that you get enough Vitamin D throughout the year. It is currently recommended by Public Health England that adults in the UK take 400IU of Vitamin D everyday as a MINIMUM. Vitamin for bone health, muscle function and wellbeing. It is also cardio-protective, anti-inflammatory and prevents cancer. 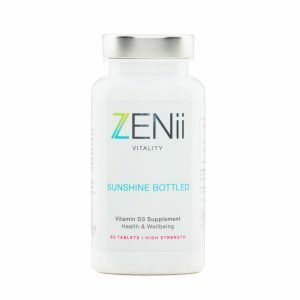 Try ZENii Sunshine Bottled ~ Premium Vitamin D3 taken daily and ZENii Moisturising Sun Protection.